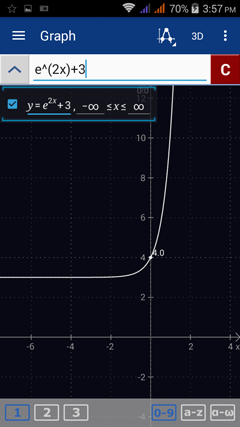 An exponential function is written in the form f(x) = y = b^x or f(x) = y = e^x​ where b is a real number such that b ≠ 0 and b ≠ 1, and x is any real number. 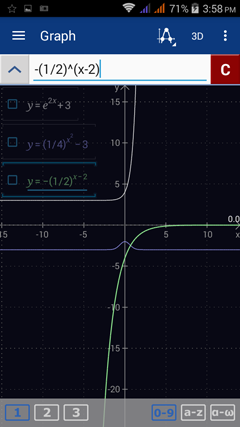 Note that the independent variable x appears in the exponent. 1) If the equation is defined explicitly i.e. "y =," enter only the expression for the exponential function using the x^ (exponent) key and e for expressions with base e. If the base involves a fraction or more than one term, enclose it in parentheses before raising it to the given exponent. If the exponent includes more than one term, enclose it in parentheses as well. Use the exponent key x^n to enter an exponent. Enter the argument in parentheses. 1) Enter the expression: e^(2x) + 3. Hit enter to go to a new line. 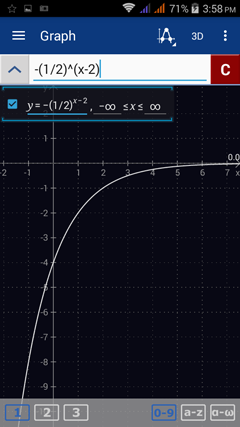 2) Enter the expression: (1/4)^(x^2) - 3. Hit enter. 3) Enter the expression: -(1/2)^(x - 2). 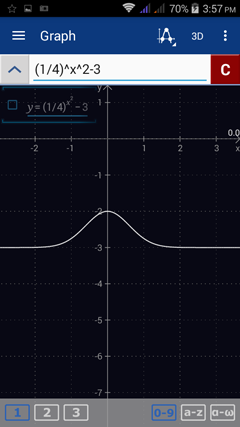 To look at the graphs individually, enter one equation per workspace.